A view down into Mjóifjördur in the Icelandic East Fjords is very promissing. 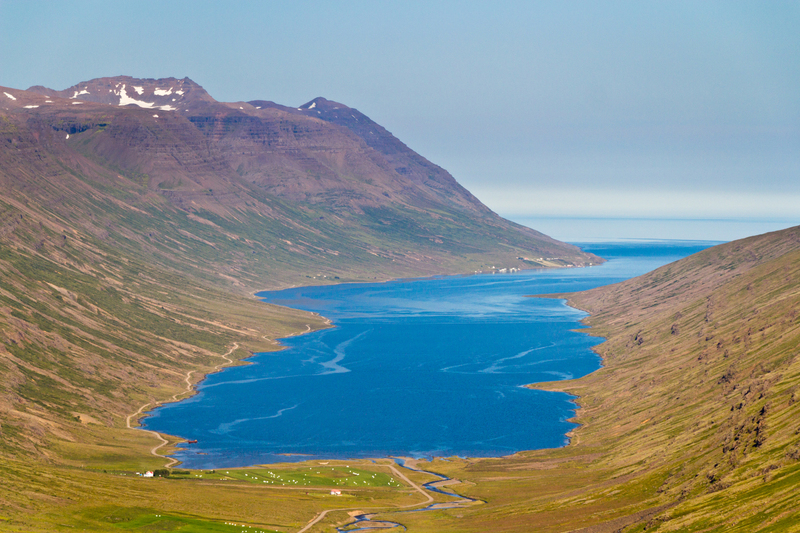 The fjord is steeply settled between the mountains and the pass road that we drove is only open in the summer. It is, however, the only road into Mjóifjördur. Though the fjord is known for good weather, the winter conditions are hard and the people living in the town that you seen on the left hand side of the fjord can only travel by ferry in the winter. The steep and winding road down is a rewarding journey, though. The views are spectacular, the waterfalls countless and lined up neatly - though no photo motive in the late afternoon because the main falls were backlight horribly - and an interesting ship wreck at the bottom. You can see it in the picture. Can you find it? There are also the remains of a whaling station but we were running late that day and you just can't drive everywhere, can you? The blue berries were absolutely amazing, though, so we did not feel left out of anything.